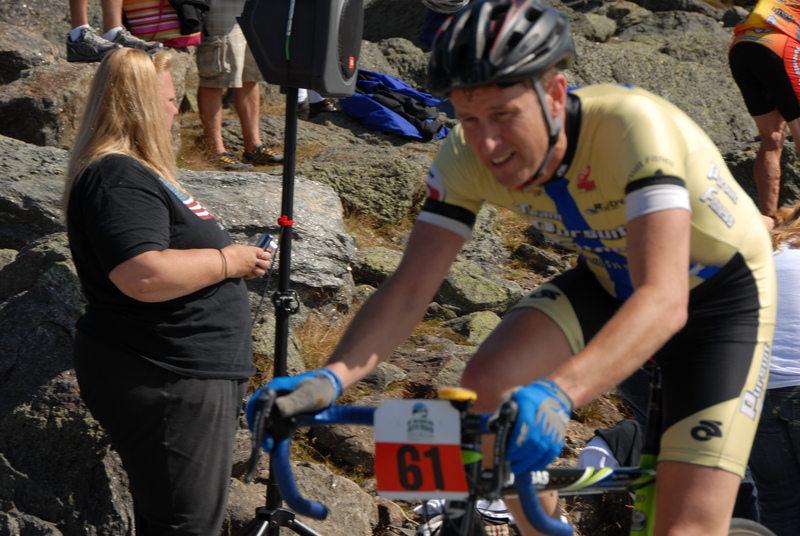 Mt Washington Auto Road Gravity Challenge | The challenge: Take an aging athlete and car and prepare them to race every event the Auto Road has to offer in the same season. The challenge: Take an aging athlete and car and prepare them to race every event the Auto Road has to offer in the same season. Throughout this year folks have asked which part of the “Challenge” was my favorite. I would have to say hands down, sharing the adventure with my wife, Sas. For many of the events this was her first experience with them, and I truly enjoyed sharing them with her!!! We both looked forward to heading back north for this last time, with everyone so excited and supportive of this effort. 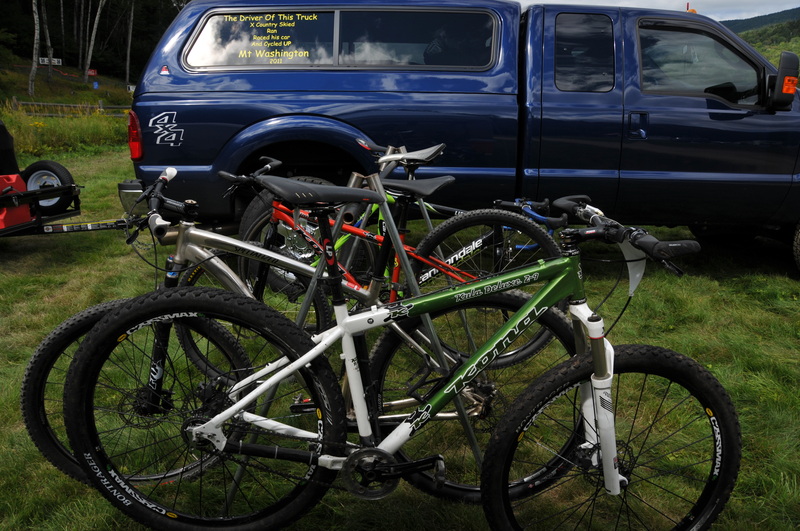 The crew at the Auto Road and Great Glen Trails are the best and they feel like old friends now! Our stay at the Eagle Mountain House was the best!!! The fellow competitors and supporters with whom we shared the events made it all worthwhile. 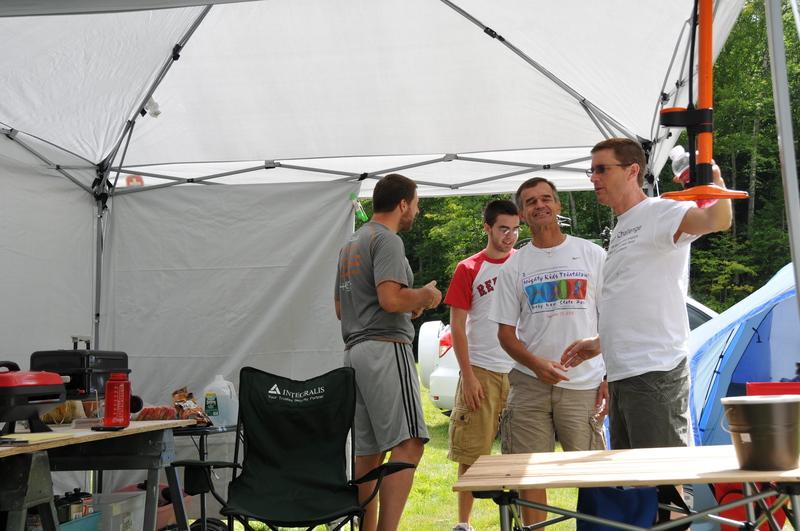 Each event seemed to bring a new group of friends and new acquaintances with us, which made it that much more special! The entire experience gave me the opportunity to learn to enjoy the process and each event, instead of just racing for time. I knew that this was to be a big challenge for me – being of a “Type A” personality! I believe I kept it all in perspective and truly enjoyed it all!!! It was a lot of fun to experience some events with my family first hand, as these events really needed to be seen rather than to be heard about. I am so thankful for their great support and love! 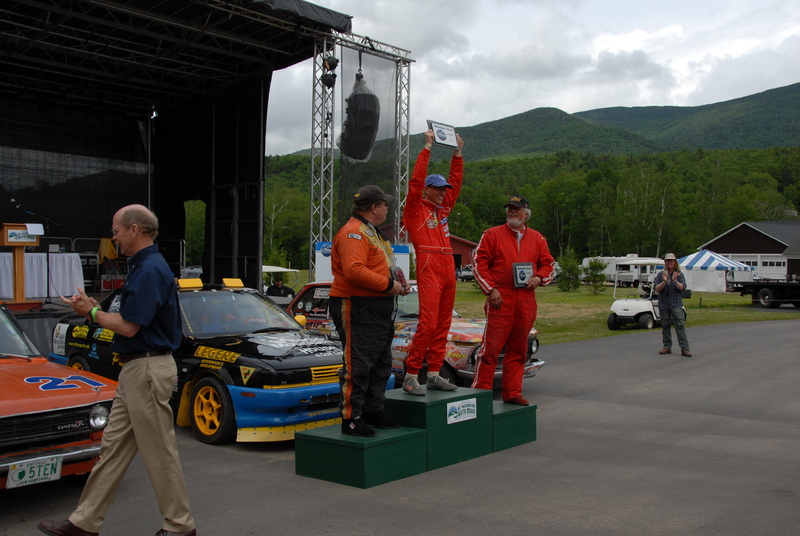 I will have to say that the Climb to the Clouds Auto Hillclimb stands out! This was the event that first brought me to the Auto Road back in 1993. It was so great to see my long time racing buddies and their families!! This event also spanned 5 days and only had 60 competitors – which, as you can imagine, only breeds true camaraderie!!!! I came into this event with very low expectations, and right up until my final run up the hill, I was sure I would not even podium with all the other great racers in my class!!! And to win my class in the car I have raced 9 previous years with on the hill was … well, I am not even sure I can put it into words!!! It was the greatest and most meaningful event!!!! Well that is about it! I hope you all enjoyed following my “Gravity Challenge” – it was just another great year of my life!! How lucky am I - to even have the opportunity, the luck, the health, and the support to attempt this “Challenge” in the first place, much less to share it all with Sas!! 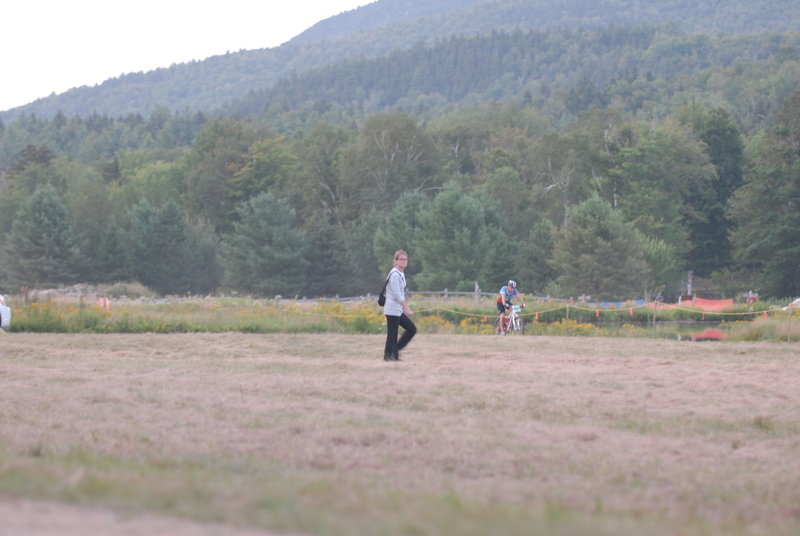 Sas and I decided to stay up in NH the week between the 24 hour mountain bike race and the bicycle hillclimb. 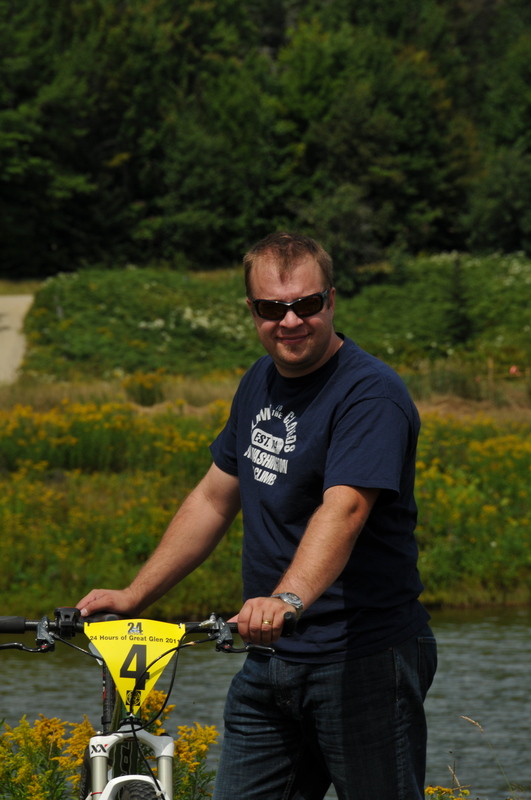 While Sas worked remotely, I got a chance to enjoy another great part of NH on my ATV. 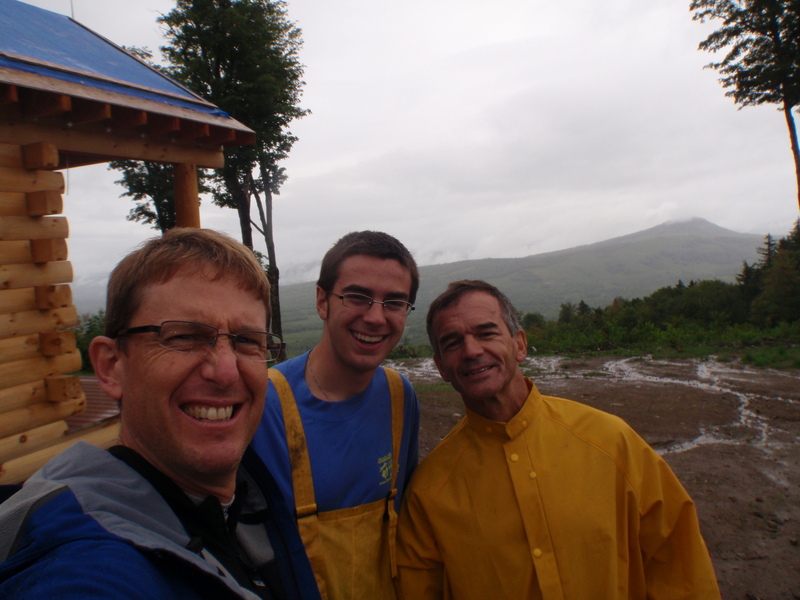 Coach Al and AJ rode with me both Monday and Tuesday in the rain, which was still great fun. 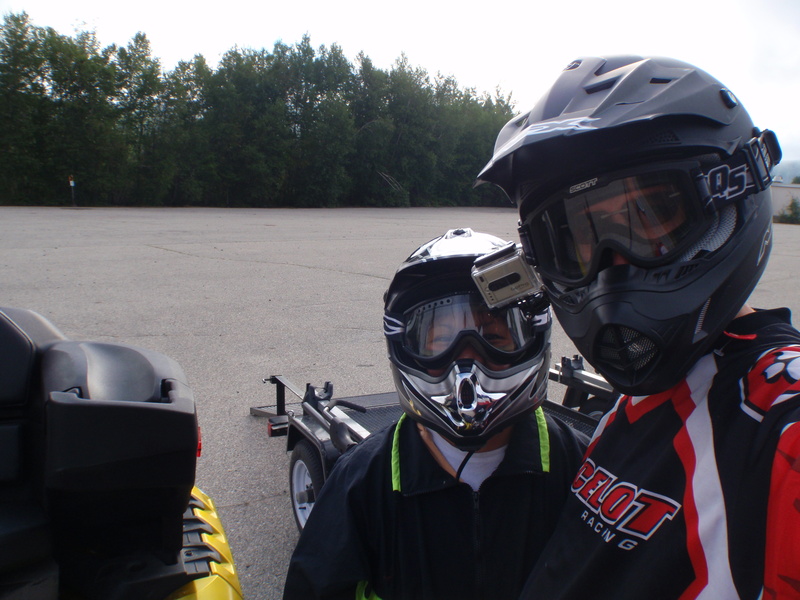 We had the entire Jericho ATV Park to ourselves!!! On Wedesday, Sas jumped on the back of the ATV to see the place we have all be talking about. With great luck, a big Moose jumped out of the woods onto the trail right in front of us! Very cool thing to see!! 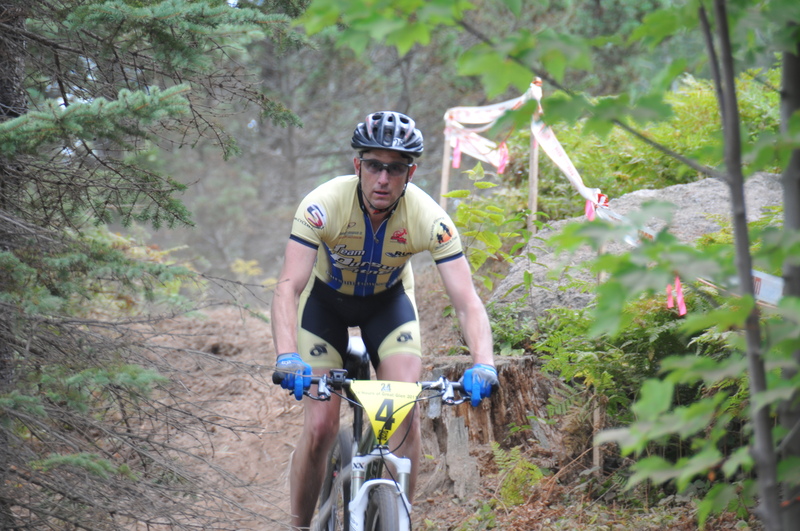 On Thursday, I got in some hill repeats and rode a lap of the weekly mountain bike race course at Great Glen Trails. 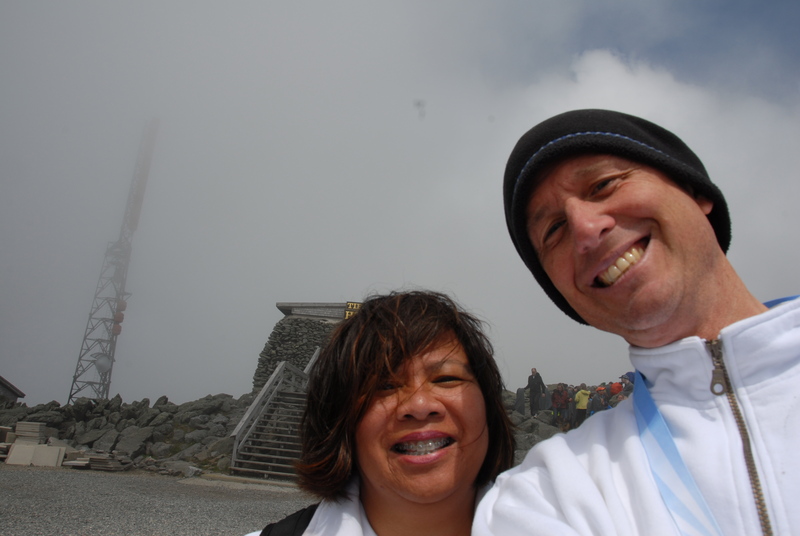 We also got a chance to ride the Cog Railway, the last and final way to reach the summit of Mt Washington! If I had a dollar for every one of these pictures I have …. Friday had us moving from Mt Madison in Gorham back over to the Eagle Mt House in Jackson (our home away from home this past year . Jeff and I warmed up on the road and just enjoyed the amazing and beautiful morning. The sun was bright and the temps just right. Better yet we could see the summit!!! We both talked about what power we were going to target … it sounded like we were going to be in the same area and time. We both started in “Top Notch” but knew we would quickly be off the back of the group, but no worries!! I just needed to get to the summit one more time! As I rode to the last climb (22%) it was great to hear all the cheering and the cow bells ringing, as I love the support and energy everyone brings to these events!!! 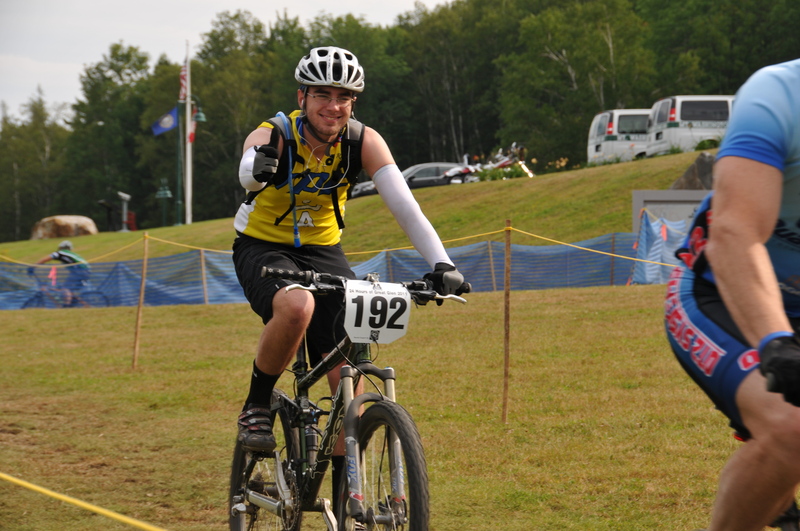 I suffered up the steep grade and across the finish I rode, I held up my hand to show 5 events done! 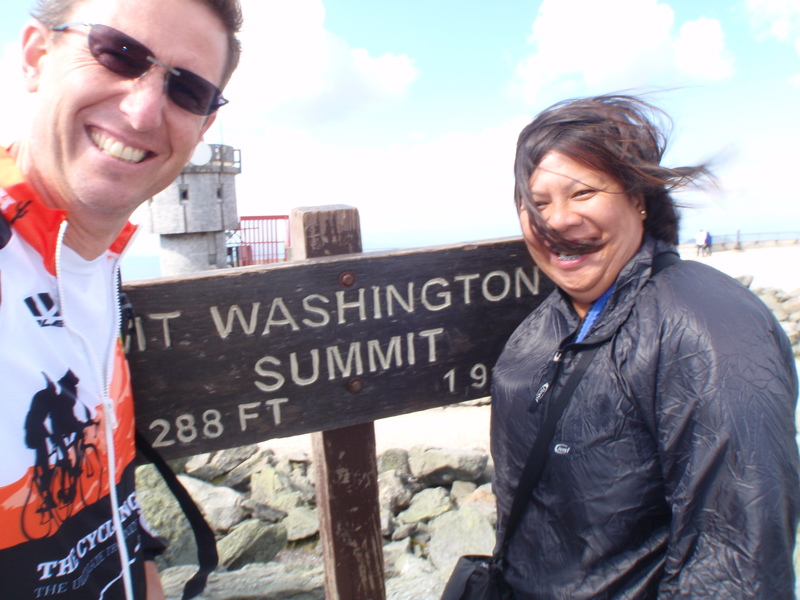 The last few feet of my “Challenge,” I look like I am having fun… right? My slowest time up the hill on a bike to date! But it’s all good, and a perfect way to finish this challenge. As I have stated already, a big part of this challenge was to not worry about results, but to just enjoy the journey and more importantly, to share it with my wonderful wife, Sas!! Jeff finished strong and enjoyed, what I believe, was his 10th finish up the road, nice!! Sas and I worked our way back down to where Bull had parked the truck and just hung out on the tailgate cheering on all the riders, again what a terrific way to finish my challenge!! 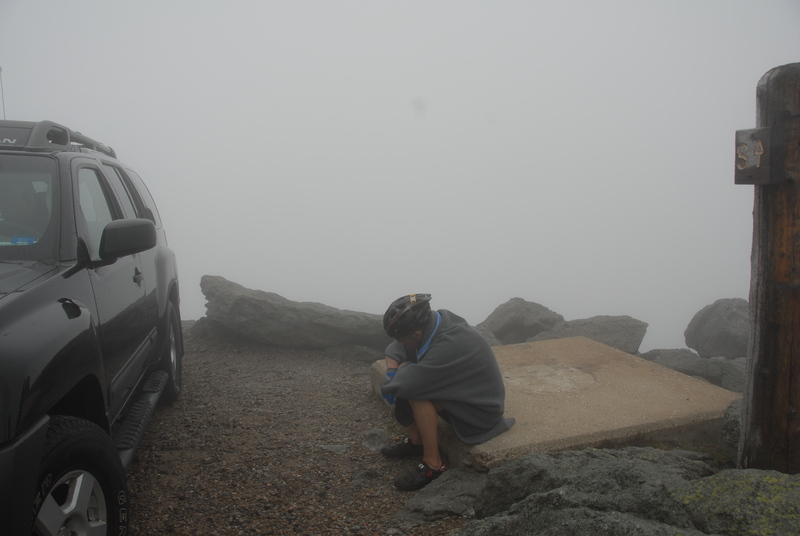 Resting after a hard but very satisfying year on the Mt Washington Auto Road!! This was to be the only event not “on or up” the Auto Road. I added it as a little bonus since it was held at the base of the Auto Road and put on by the same great folks at Great Glen Trails. 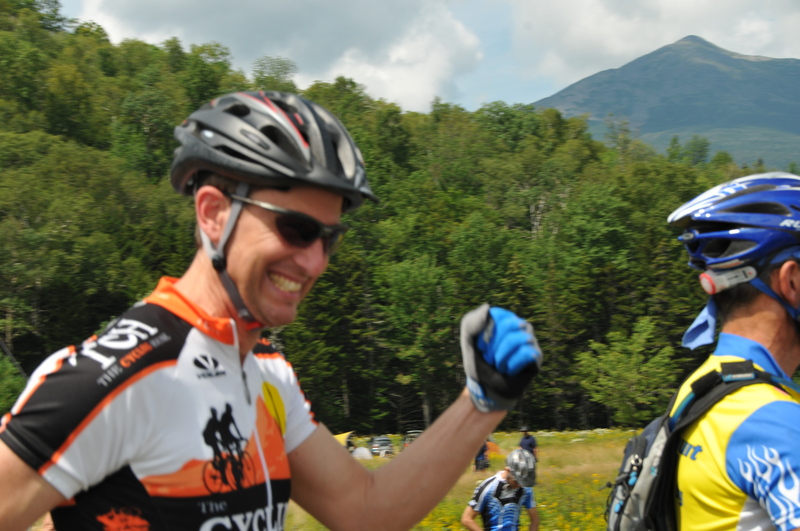 I had been working on Coach Al and my buddy, Rod (my mountain bike riding buds) to put together a team for this race. It did not take that much convincing, and they put together a 4-man team. Team Pursuit Fitness, Rod Wilson, Coach Al, and “AJ” Lyman (Coach Al’s son). Classic picture with Rod and Al with their Blackberry’s in hand! Their fourth teammate regrettably had to drop out. One of the neat things about the 24 hour race is you camp out Friday and Saturday nights. 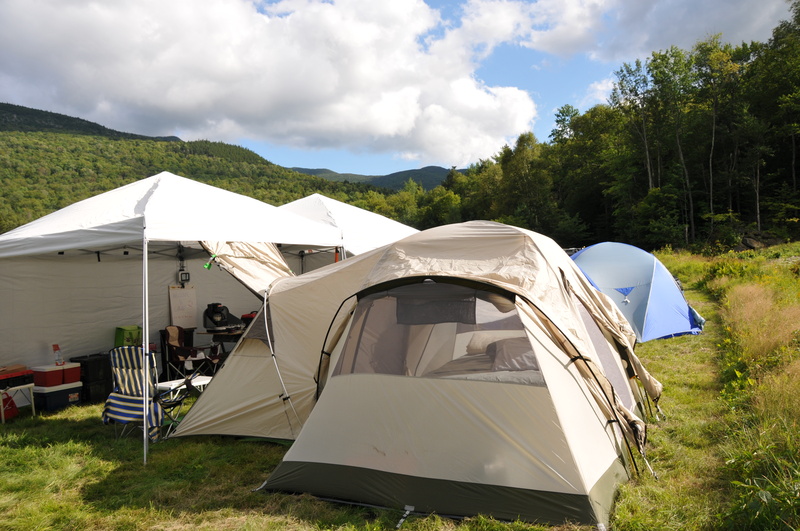 The field at the base of the Auto Road is transformed into quite a tent city! Anyone who knows me well, knows how much I enjoy my “gear” and this was a great chance to pull it ALL out . With the truck all packed up, and the ATV in tow, we headed back up for the last time this year . We grabbed a nice spot and began setting up camp for the weekend. Rod followed us up and was there to help out (after figuring out his own tent). Al and his son AJ showed up a short time later. We were also treated to the company of my Sister, Marcy, and her husband, Phil. We had almost as many supporters as we had riders ! The weather looked great and the riders headed out for a course recon lap. AJ and I coming down the “plunge” on our recon lap Friday. I came into this weekend like I have for most of my events this year.. with the attitude of “well lets just ride and see how it goes.” I might ride 1 lap or 23, I will not know until I get on course. The race started at noon Saturday and Al (the first rider on “Team Pursuit Fitness”) and I lined up for the “Le Mans” run around the pond, then on our bikes and on the course. Al and I made our way around the pond at a nice easy walking pace. The type A riders all ran . I was in no hurry, heck, we have 24 hours to go!! Phil waiting patiently with my bike a the start. It was great to have him there!! The first lap is always interesting. All the riders are bunched up and trying to seat themselves. We started at the back and slowly picked off riders. My legs did not feel all that great as I made my way around the course. I started down the “plunge” (about 3/4 mile from the finish) and caught the edge of one of the logs and blew out the bead on my front tire. I stopped and tried to fix it but the tire would not hold air so I walked the bike in… not a great way to start my first lap of the race, but again, I have 24 hours to finish this! Luckily Phil found that I just had some tree bark in the tire bead and once removed, I was good to go! 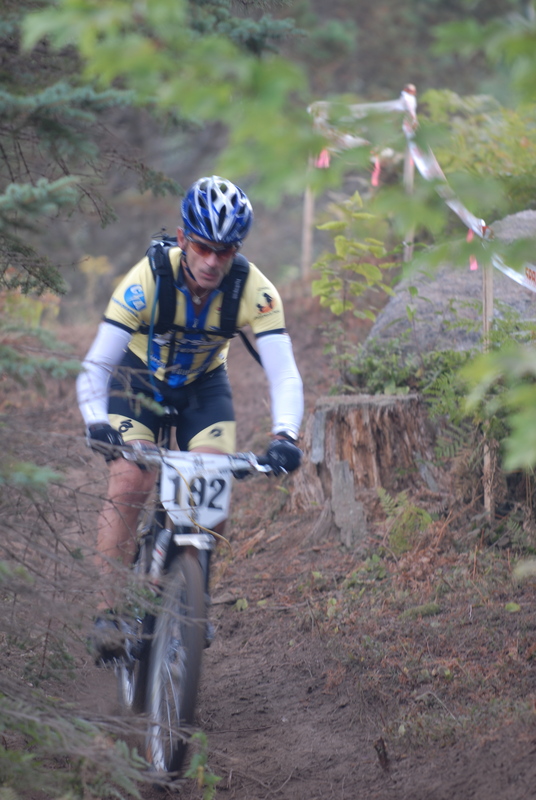 Back out on course… I ended the day with 4 laps and some very tired legs. I showered and had some dinner, still unsure if I would even head back out on course at all. In the meantime Al, AJ and Rod were picking off laps and having a blast! Both Al and Rod got in some night riding, Rod called it a night around midnight. I was in bed around 10pm . I awoke to the sounds of Rod getting ready to head back out on course, not sure of the time. Sas and I got busy cooking up some breakfast. Bacon, eggs and yes SPAM as well as a few pots of coffee. I love breakfast!! Meanwhile my Sister Marcy was tirelessly making sure no one in our group finished a lap without her there to cheer them on! Man talk about support! It is hard to explain how nice it is to be greeted and cheered for after a long lap out on the course! Rod coming in after an early morning lap. The organizers hire a bagpiper every year to play as dawn comes up for the event. I enjoyed a great breakfast with no real plans of riding any more.. Just kind of enjoying the whole weekend for what it was. After breakfast, Rod came back in and Al suited up and headed out on course. I grabbed my camera and headed out to get some shots of him. AJ out enjoying another lap. AJ had a great race, with almost no long rides under his belt he stepped up and showed us how great it is to be young ! After running around trying to get some pic’s of Al, I decided maybe I could jump back on my bike and get in another lap or 2… So out I went.. 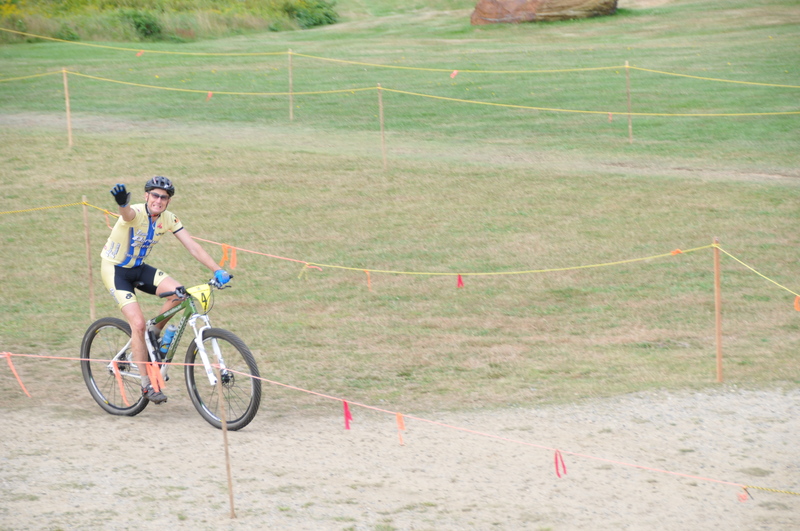 The first two laps went pretty well, I even got a chance to help Coach Al with a broken chain. 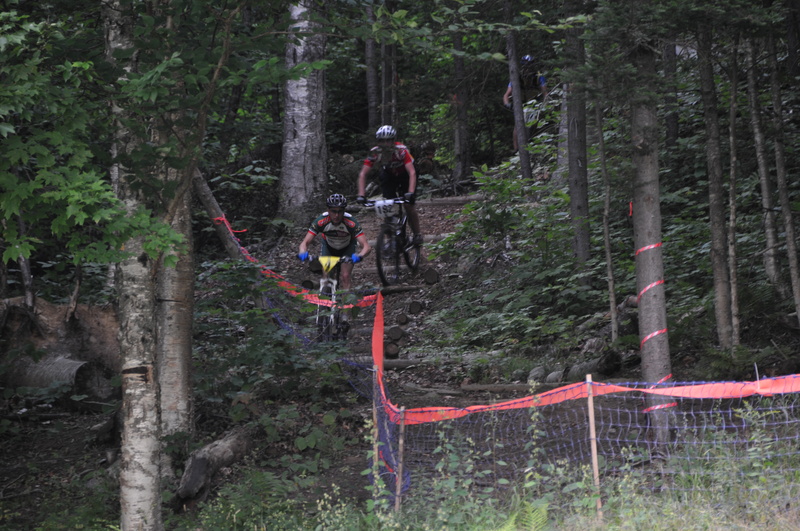 The third lap was a little tougher…. I was starting to think maybe I could get in 4 laps if all went well…. but just into the start of the lap I lost my water bottle.. not good, as it was starting to get warm out… I was also starting to cramp a bit. With about a mile to go, I got a rear flat tire. I ride tubeless with tire sealant, but the hole was too big for it to seal. I had a tube with me but decided to just try and ride it in as I kept adding air with my pump. After my first lap issue with the “plunge” I decided to take the walk around route for the rest of my laps.. Going through the timing tent, heading out for another lap..
Time was ticking and I was not sure if I would get in my 4 laps before noon. If you come in just before noon, you can head out for one more lap, however there is a time limit of 1:15 pm. My plan was not to head back out for a 5th lap but the type A in me still wanted to finish under 12 noon … just because . 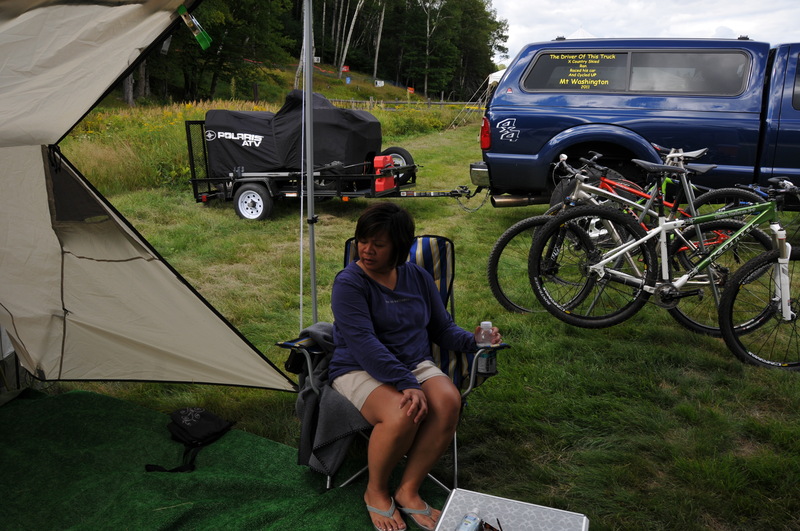 I added more air at the timing tent and headed back out for my last lap. Besides the cramping, I still felt pretty good, much better than the day before. About a 1/2 mile into the lap I was losing too much air so I decided to add my tube to the rear tire, getting worried I would not make my 12 noon goal. I changed it, and off I went. The first few miles of the loop were almost all uphill with most of it too steep for me to ride on my single speed bike. After all the “hiking,” I cramped so bad on a flat section that I fell off my bike. Both calves and quads locked up like they never have before!!! It has also started to rain out for the first time of the weekend. I sat there in pain, I could see the finish tent across the field even though I was only 2.5 miles into my 8 mile loop, and thinking I could just limp in and forgo this last lap. But I decided to give it a little more effort. I really wanted to finish this last lap, so I collected myself and got back in the saddle. I still had a few twinges but overall was holding off any more cramps. The last two laps I rode almost all the hills I had walked the day before. I was still putting in some pretty fast laps for SS. Walk/ran the last long hill and rode in with 5 mins to spare. I was totally shot but very happy with my effort and weekend, mission accomplished!!!! We spent the afternoon repacking the truck and headed off to the Eagle Mt House for a comfortable bed and a nice shower. It was a great weekend and I feel so lucky to have Sas with me to share this event with! Sas taking a break from running around taking pictures and being a great help to our weekend. Thanks Sas!! After 5 hours and 15 mins my body is done! It is a great course but tough! Only about 5% is double track to allow you sit up and take the pressure off the arms. My triceps are totally shot from the rough course. I had hoped to ride more but when the body says it’s done, well it’s done!!! Still the longest ride of the year! It was great sharing the event with Sas and my family. I think they now understand the sport a little better. 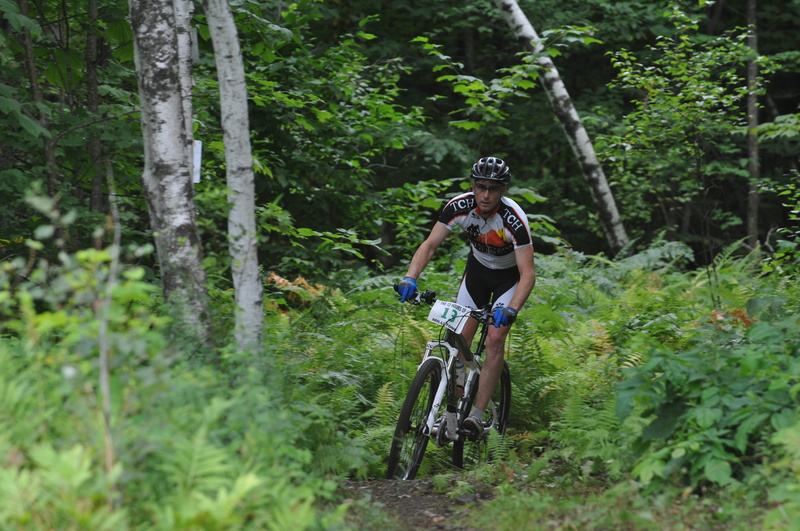 Hopefully we can ride a little longer at the 24 hours of great glen race in 2 weeks. Settling in …. lunch anyone? His first lap – and he’s “having fun!” losing some air in tires (apparently Tim kept them soft for tree roots), but a stop in the pit and he’s good to go! He’s on his planned time – about 56 minutes or so … And he’s feeling good! Perfect start to a 12 hour bike race! 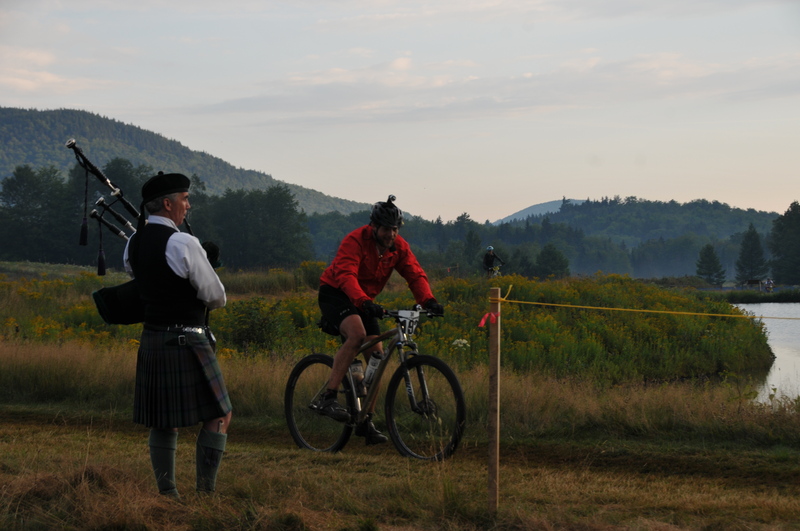 It’s a beautiful, cool, slightly windy, and mostly sunny VT morning – perfect for a 12 hour bike race! We’ll keep updating throughout the day from the “support crew” staff (in between ringing our cow bell to cheer Tim and everyone on)! Well Sas and I have been enjoying a few weeks at home!! I have gotten in some solid road and mountain bike rides during that time as well. I am also continuing to run as part of my training…. 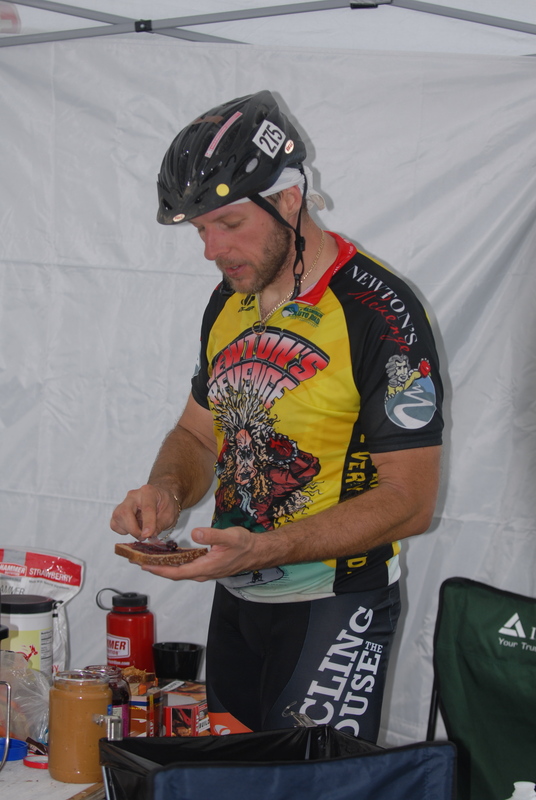 My goal is not to ride straight for 12 or 24 hours but to just to challenge myself and my fitness and most of all have a great time and enjoy sharing another type of event with Sas. 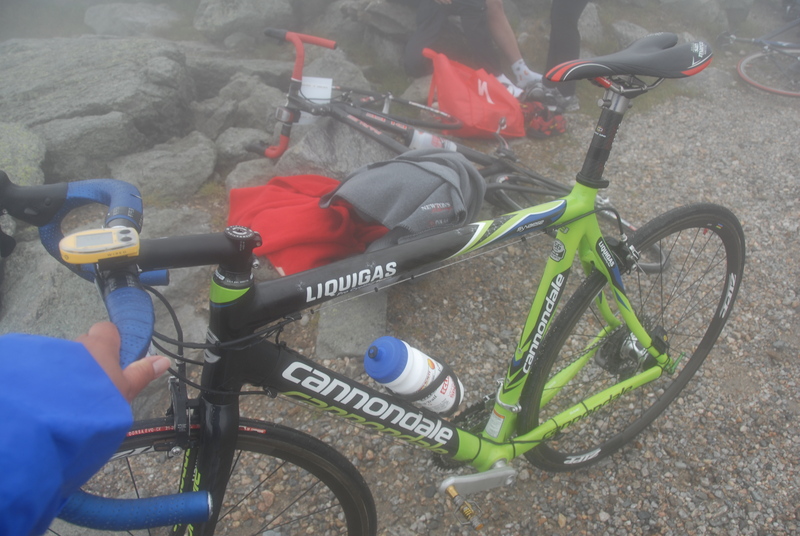 Newton’s Revenge… What a fitting name for my first cycling climb up the Auto Road! It always amuses me that just because I do active things, everyone expects me to eat very healthy all the time. Now do not get me wrong, I eat as well as I can, but in reality nothing is really “off limits.” As I have stated in the past postings, this whole journey has been about enjoyment and fun. Not always so easy for an inherent “Type A” guy like me. 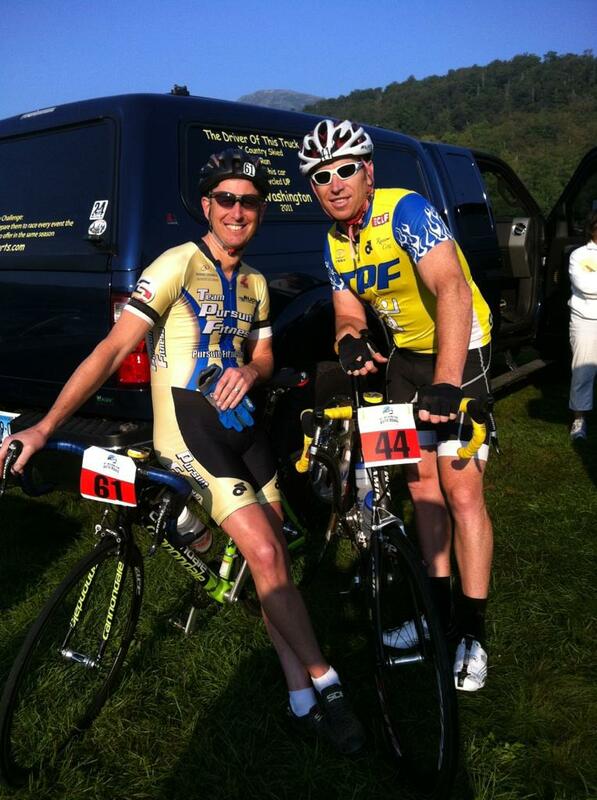 This past weekend, Sas and I headed back up to my favorite mountain for the Newton’s Revenge Cycling Hillclimb. This is this is the 4th event in the challenge and one at which I was just going to have fun. My only expectation was to try and finish a sub 1:30. I was a little worried about attaining that, but no worries! Dan Janson has a great website for those type A guys out there, he analyzes everything about most of the big mountains in the northeast. As you can see I did not have much room for error to meet my goal. The other issue I had was whether I would be starting with the “Top Notch” group. 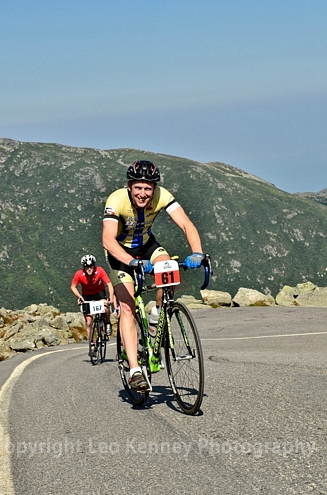 Reaching the ‘Top Notch” group at Mt Washington is kind of like qualifying for the Boston Marathon — except once you accomplish it, you are in for life. 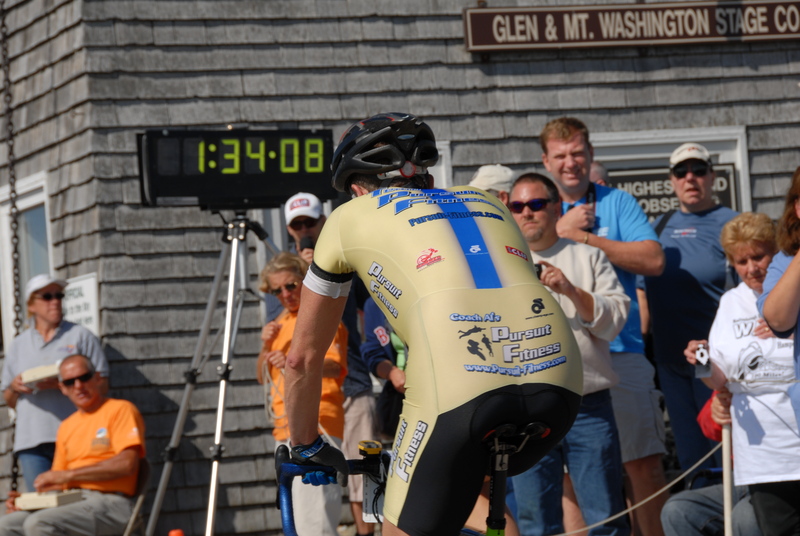 In 2006, I was lucky enough to have 2 years of Ironman training under my belt when I took the starting line for my first attempt at the Auto Road on my bike. Armed with that fitness, I road a 1:15 climb, and anything under 1:20 allows you to start up front with the Pro Riders in the years to come. 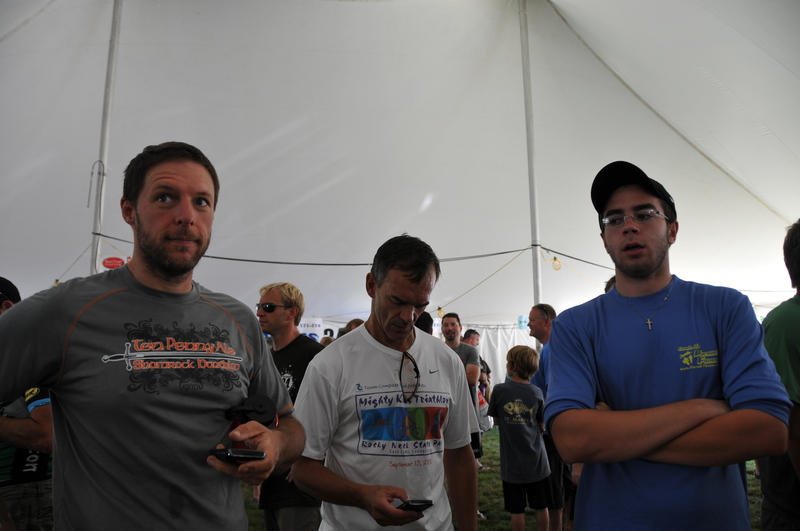 Back to the summer of 2011, without 2 years of Ironman training and 10 more pounds of fat I cannot seem to get rid of…. Not really a recipe for a top notch finish! At check-in, I found the line for my age group first, but no … my name was not on their list, and I was listed to be lined up with the fast guys…. Honestly, it took some pressure off me, as I now knew I would be the very last guy in that group, and would enjoy the other fast age groupers catching me after starting 5 mins back. Friday night at dinner, I decided not to play the part of the type A athlete and instead, enjoyed a full dinner with a beer and a very large brownie sundae. Life was very good indeed! We woke to rain on race day morning, but thankfully it was just a passing shower and the day was looking to be great! I warmed up with my buddy Rod and just enjoyed the whole process. 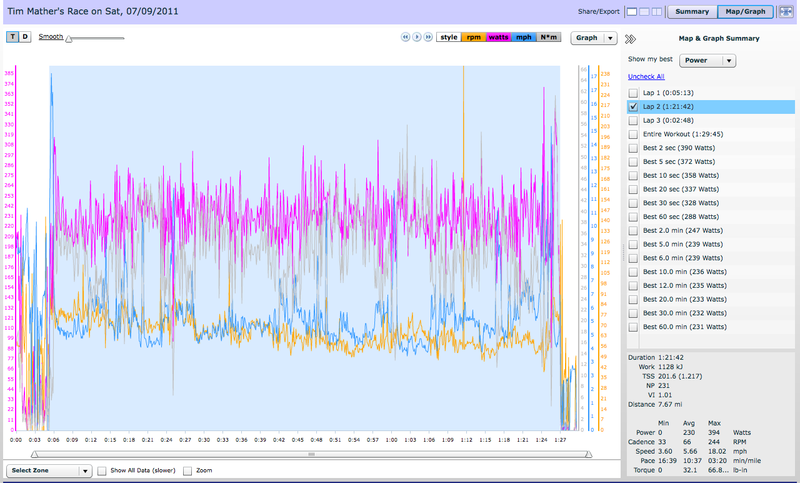 My plan was to ride at around 210 watts as I was pretty sure that was my current FTP. We lined up and I was off with the rest of the Top Notch folks! … well at least for the first 20 feet or so. In a blink of an eye, the entire group was gone up the hill! I just settled into my wattage and enjoyed the day. Around the 2 mile mark, the first of the age groupers caught me, he was out of the saddle and dancing on the peddles (he ended up winning overall!!!). I was feeling pretty good and managing my effort well. From time to time, I would push the wattage a bit to see how it felt, and so far so good. At around mile 3 I caught and passed another Top Notch rider. Sweet, no longer last in the group!!! Things were going better than expected . Still feeling good at the 4 mile mark, I looked down and found a split time of 41 mins. Hey, I might put up a decent time after all. I decided to up the wattage a bit and keep riding by feel. 5 mile grade was nicely packed, even after the rain the night before. I could hear the wind up above and was ready for it. As I rounded the hairpin I was hit with the 50 mph head wind. Funny this only fuels me! I really enjoy the epic nature of tough conditions!! I made it up past 6 mile park with the wind now at my side. At times, it even felt like the wind was helping me a little through that section. The very sharp left hander at the end of 6 mile is very, very steep but now I had a tail wind and sat up as high as I could to gain any advantage I could from it! I was digging pretty deep by now and the clouds were starting to thicken. At the 7 mile mark I caught and passed another top notch rider. I turned off my watch as I knew it was going to be close for a top notch finish (sub 1:20). 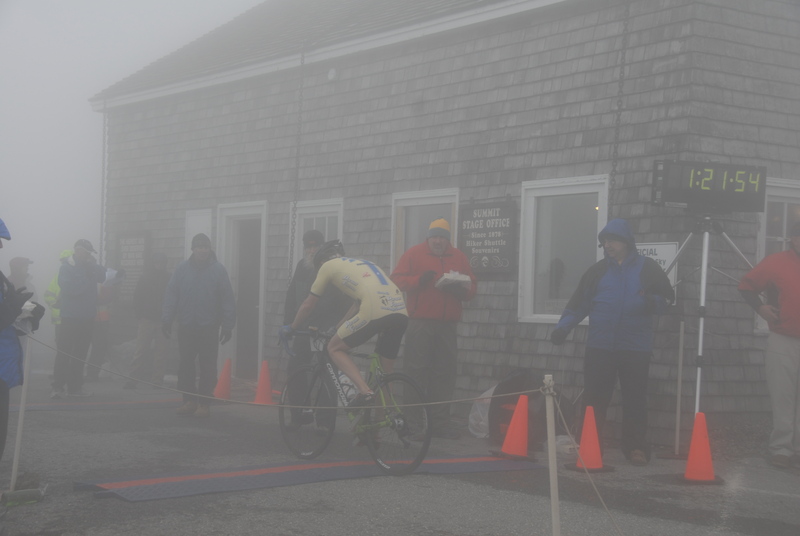 The clouds were very thick and I could not see 10’ in front of me but I could hear the cow bells and the cheering at the finish. Just after where the car finish line was, the road flattens a bit. I shifted to my middle ring and pushed as hard as I could. When the road kicked back up I could not shift back down, I kicked the derailleur a few times and it dropped back down. There was no way I was going to ride the last 200 yards of 22% in that gear!! Just as I hit the steepest part of the hill, the rider I had just passed came by me out of the saddle. I had no response for that!!! I was going to be lucky to get in the dozen or so peddle strokes needed just to finsh!! As I looked up, I saw a 1:21 on the clock, NICE!!! I just made it across the line and almost fell off the bike. I got my medal and my fleece blanket and just hung on my bike for a few mins to collect myself… I had nothing left, just the way I enjoy finishing a hard effort!!! I found Sas (or maybe she found me) and had to sit down. It was a great ride and one I am very proud of! Here is my Power Tap file. 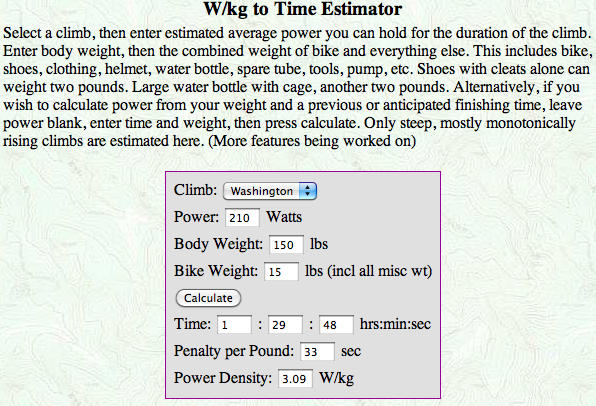 I was very happy with the 230 watt average!! I got changed and waited for my buddy Rod to finish, he came across with a huge PR. It was a great day!! We all enjoyed the great turkey dinner at the base, and then Sas and I headed home. Another great weekend at Mt Washington!!! Deb Plant on Not done training yet…. Al on The Day is finally here! Sas on The Day is finally here!